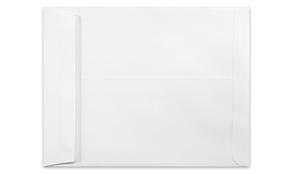 8 3/4 x 11 1/4 catalog envelopes in 24lb. bright white paper. The closure is a standard moisten to seal gum found on most envelopes. Latex "quick stick" or Peel & Stick can be added to make sealing easier.